This comprehensive five day tour will give you real insight into the spectacular Highlands of Scotland. Experience the stories, landscapes, legends and people that make the spectacular Highlands of Scotland such a distinctive and romantic place with this comprehensive five-day tour. From Glasgow we travel via Rannoch Moor to stunning Glen Coe, where we make our first stop, before continuing on to Fort William. We drive through the Great Glen to mysterious Loch Ness, where you can visit Urquhart Castle and take a monster-spotting’ cruise *. Our home for the next four nights is Inverness, the 'Capital of the Highlands'. Your stay in Inverness is unescorted, so you can enjoy your time here as you please. Today’s full-day excursion leads us to the delightful Isle of Skye. We travel through Glen Shiel, passing the Five Sisters mountain range, to our first stop at romantic Eilean Donan Castle *, perched on its island at the head of Loch Duich. You have time here to visit this most picturesque of castles. After a stop for lunch, we follow the scenic route with wonderful views of the striking Cuillin Hills all the way to Portree, the island's main community. Why not take time out to visit the picturesque harbour with it's colourfully painted houses? We return to the mainland and the village of Kyle of Lochalsh. The last leg of our journey takes us through pretty Glen Carron to Achnasheen for the short return to Inverness. We travel today to one of Scotland’s remotest and most picturesque areas: the Applecross Peninsula. We first cross the Black Isle to the village of Achnasheen. Our coach then climbs over the dramtic Bealach nam Ba, which means the ‘Pass of the Cattle’ in Gaelic, the UK’s third highest road at more than 2,000 feet. You will have time in sleepy Applecross to enjoy the spectacular seascapes or discover the controversial tale of the Highland Clearances at the local heritage centre. Nature lovers should look out for otters, red deer and pine marten (one of the rarest of British mammals) in an area rich in local wildlife. Our last day of discovery takes us to the scenic Black Isle and the attractive fishing village of Cromarty . We pause at Chanonry Point, a popular vantage spot for catching sight of the colony of dolphins, for which the Moray Firth is home. We also stop in the attractive town of Beauly before travelling through Glen Convinth to Drumnadrochit and the award-winning Exhibition *. Our return journey south encompasses the Spey Valley, the picturesque Cairngorm National Park and the dramatic scenery of the Drumochter Pass. 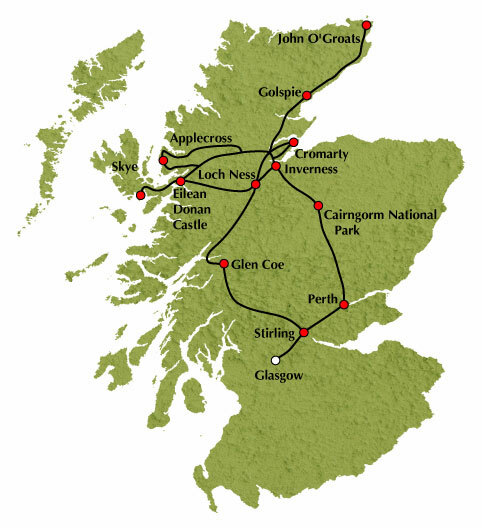 The last part of the journey will take us through the heart of scenic Perthshire then onwards to Stirling, where there are great views of its magnificent castle to enjoy. Our tour ends on arrival in Glasgow. Tour Highlights: Glen Coe, Loch Ness, Inverness, Eilean Donan Castle, Isle of Skye, Glen Carron, John O' Groats, Duncansby Head, Bealach nam Ba, Applecross, Beinn Eighe National Park, Cromarty, Cairngorm National Park and Perthshire.